We're back from our trip to Tasmania where we enjoyed some delicious food and wine, it was nice and relaxing too. 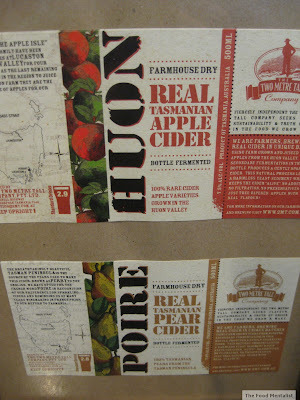 I spotted this cider at a small boutique bottle shop in Hobart and thought it would be nice to try. Before I discuss this cider, just take a look at the picture above. See those mountains in the distance? That is Freycinet National Park. Well, Pete made me hike up and down between those two mountains all the way to Wine Glass Bay. And whilst I can't say I enjoyed it at the time ( my current fitness level is average and I puffed and moaned all the way), I can say with hindsight that it was fun and I gained a great sense of accomplishment in doing it. Back to the cider...The Two Metre Tall Company is owned and managed by Ashley & Jane Huntington who source all of their apples from the southern part of Tasmania from orchards in the Huon Valley. Upon trying this cider I was surprised at just how dry it was, despite it's name. It reminded me of the many ciders I tried in London & France during our honeymoon. I was therefore, not overly surprised to find out that Ashley Huntington had previously held the position of senior winemaker at Domaine de la Baume in the Languedoc region in France. 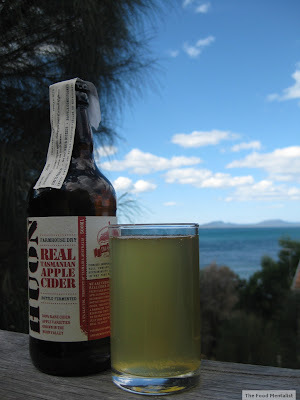 This cider is unique, very different to the ones I have reviewed thus far. As you can see it is slightly golden in colour and has a decent amount of carbonation.It is also very cloudy which is a result of the fact it is fermented in the bottle. 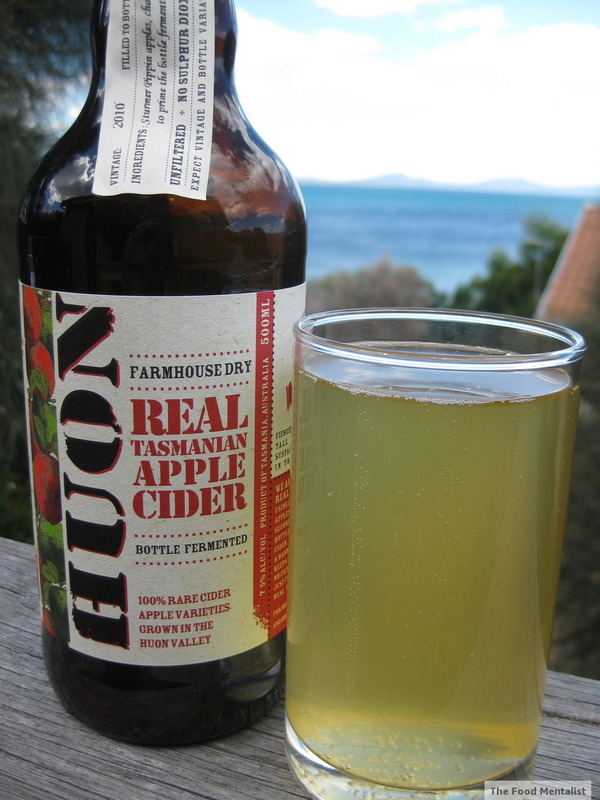 What I love about this cider is that it doesn't have any preservatives. Which is fantastic! It is very dry and has strong earthy flavours, so much so that you can almost taste the farm where it is made. It is quite tart and has a slightly acidic finish. As for sweetness - well, it doesn't have much at all. 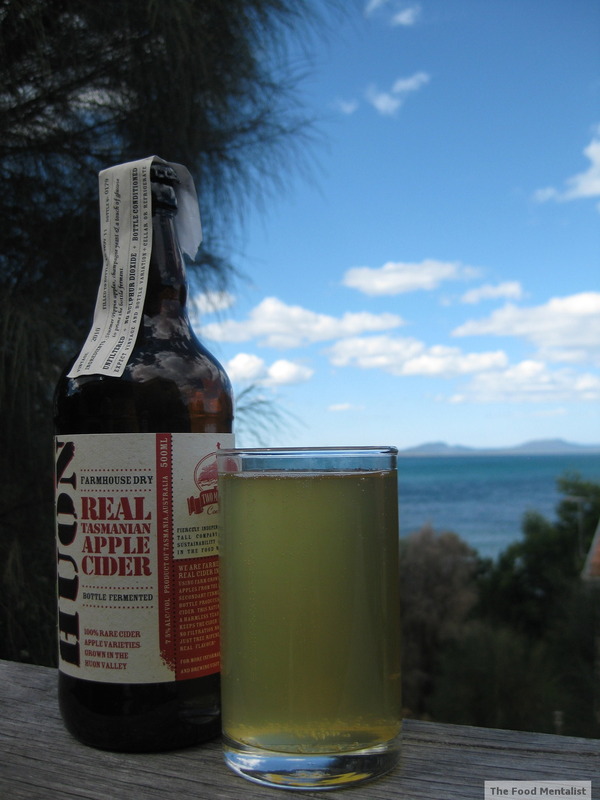 This cider will suit those of you who want something dry with little, if any sweetness. It will also suit cider traditionalists, because as mentioned above this one is very similar to traditional British & French ciders. This cider is the strongest I have tried so far and at 7.9% alcohol, it will set you back 2.9 standard drinks as it comes in a 500ml bottle. I was also surprised at the cost of this one it was just over $11 for the 500ml bottle. Hope you are enjoying your weekend. I can't believe I have to head back to work on Monday! Yuk! Enjoying your cider posts... and love that you did that hike. We arrived there unprepared for such a long hike... definitely on the list of things to do next time we visit! I was sold at 7.9% alcohol in a 500 ml bottle.. A few drinks in one big bottle! Too bad I'm unlikely to find it in WA.